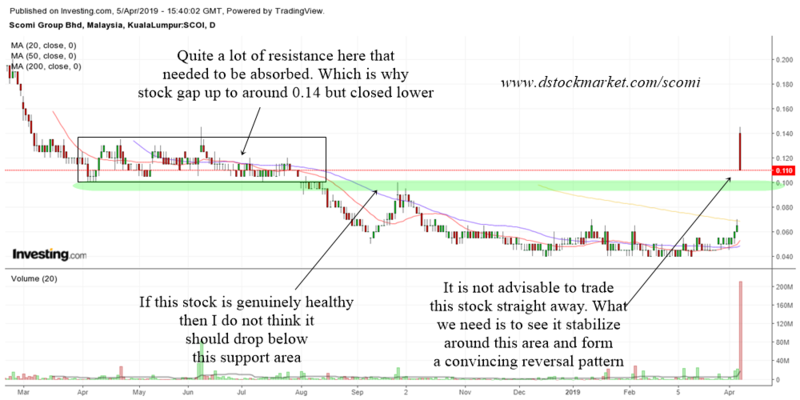 An analysis of Scomi's stock from a technical analysis point of view. Is the stock in an uptrend or downtrend and is it conducive to trade? That is what we will seek to answer in this page. One of the biggest gainers today in the KLSE, Scomi shot up almost 70%. Not bad if you had bought it yesterday. But the overnight gap up is a result of the company resolving their issues with Prasarana. You can read about it at The Edge's article titled Scomi Group shares most actively traded after settlement with Prasarana. I think this big gap up will draw the attention of many people who want to know whether they should buy this one in the hopes that it can go higher and higher in the near future. I do not know the fundamentals and I do not know the whole story so I will leave that to you. But what I can do is to look at the technicals and map out the support areas so you can understand it better from a technical point of view. If you can see from the daily chart, this stock had quite a lot of sideways trading congestion area on the left. That resistance needs to be absorbed and that is why Scomi actually gap up to around 0.14 but closed lower at 0.11. Yes supply needs to be absorbed. I have highlighted the support area in green. 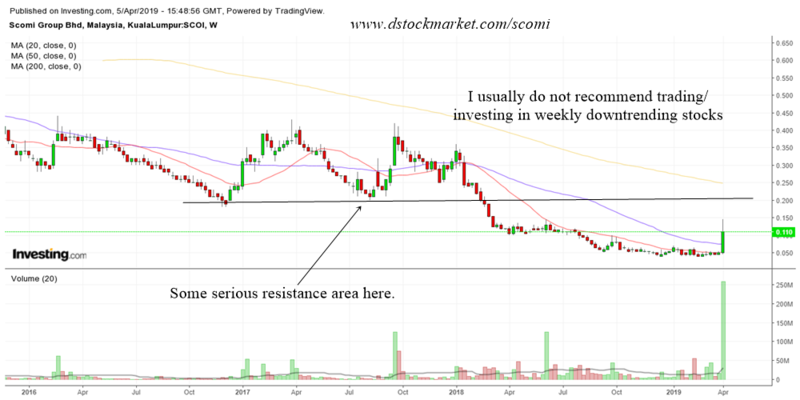 I think if Scomi is any good it should not drop below this support area. The stock did not go through the normal process of bottoming and starting a new uptrend. Instead it kind of gap up above the 200 day moving average. A bit fast I must say. I don't think its a good idea to trade it the next day. One should wait for the stock to stabilize around the support area and watch carefully if there is any reversal patterns before thinking of dipping into this stock. Looking at the weekly chart, well it is definitely in a long term downtrend. Not a good stock to play or invest in. There is some serious resistance around 0.20 so if you are hoping for it to shoot to the moon then you should be aware of that resistance area. So, in conclusion this stock is not that suitable now for a buy and hold approach. Rather wait for signs of reversal near the support and see if you can buy there. Perhaps in a few days or a few weeks things will be clearer for us.